There is still no word about when Nvidia’s flagship GPU, the GeForce GTX Titan Z will finally be available to us. The card was to be released in April but has repeatedly been delayed – with software issues being cited as the reason. The GeForce GTX Titan Z is expected to be a monster with some mega-specifications. Based on Nvidia’s GK110 architecture, it is to feature dual cores, with 5760 CUDA cores, 448 TMUs and 96 ROPs. These will be coupled with a huge 12gb VRAM. Now some sources expect the launch date of the card to be 28th May, which is next week. There are several assumptions as to what could be in behind the scene software workings going on at Nvidia. Drivers to provide more power and improved SLI profiles are the ones which have gained the most traction and credibility so far. 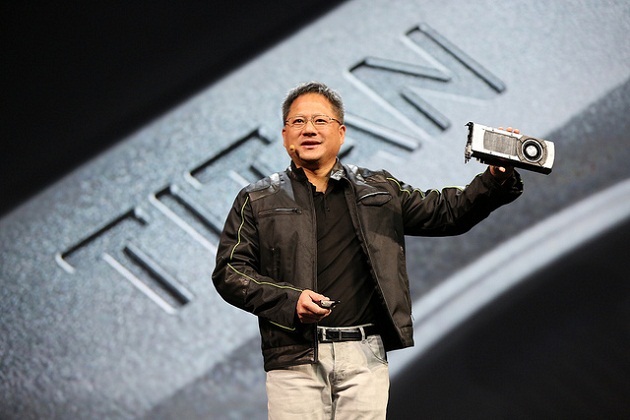 Jen-Hsun Huang Defends $3000 Nvidia GeForce GTX Titan Z Price In Interview. Also Denies Rumors Of Possible Shift. Nvidia’s CEO and founder Jen-Hsun Huang has answered some questions about the GeForce GTX Titan Z, it’s release date and price. Other things covered in the interview include queries related to Tegra and it’s use in smartphones, Microsoft Surface and plans for new Shield devices. Previously we informed you about Nvidia-partner variants of the GeForce GTX Titan Z popping up on Ebay and Amazon. Amongst other things, these variants featured an even more exorbitant price tag of $3999. The cards available have been manufactured by EVGA and Zotac, with specifications being PCIe 3.0, 12 GB of GDDR5 and base and boost clocks of 705 and 876 MHz respectively. The card on Ebay was also listed as being available only for pre-order before the actual release date. Mr Huang flat out denied any reports about the GeForce GTX Titan Z being delayed or simply taken off the table. In a question asking whether the card was still on time, he replied in the affirmative. Now what ‘on time’ here still means is still up for speculation. We can only hope that it means the 28th of May. The $ 3000 price range for the card was also confirmed. In a question asking what steps have been taken to make the card relevant a couple of years down the road in respect to the huge price tag, Mr. Huang replied that all of Nvidia’s customers that purchase GeForce GTX ‘Titan Zs buy them every year.’ Finally, coming towards the most relevant and important question of the interview. When asked that whether customers would even bother purchasing a GeForce GTX Titan Z due to the $ 3000 price tag, Mr. Huang replied that those who buy the the GeForce GTX Titan Z are not concerned with money. They want the best possible performance out of their hardware and top notch computing and graphics capability. Therefore, some would even consider buying it every year. He also added about the switch to 4K from 1080p, saying that users who wished to experience 4K display resolution have already purchased monitor’s costing $3000-5000. Therefore, $3000 card to drive these monitors would easily be on the table as well.